Founded in 1964 as Blue Ribbon Sports, Nike, Inc., is an American sportswear company located in Beaverton, Oregon. It was founded by Bill Bowerman, a track-and-field coach at the University of Oregon, and his former student Phil Knight. The first retail outlet was established in 1966. The Nike brand shoe was launched in 1972. In 1978, the company was renamed Nike, Inc., and went public two years later. By the early 21st century, the company already had retail outlets and distributors in more than 170 countries. The brand is popularly recognized all throughout the world. The brand’s mission is to expand human potential. This is being achieved by creating groundbreaking sports innovations, by making products that are more sustainable, by building a creative and diverse global team and by making a positive impact in communities. The company includes the Nike, Converse, Hurley, and Jordan brands. Currently, it creates various sporting shoes, clothing, and accessories. One of its products is the Gridiron Eye Shield with Decals 2.0. Resistant to scratches and impact. Protects players from the glare of the sun. May not be able to block off HEV sun rays. Could be a little overpriced if compared to competitor brands. In sport, precision visual equipment is very vital. The patented design of Nike Max Optics delivers zero distortion straight ahead, as well as minimal distortion across the complete curve of the lens. This advancement, as a result, creating an optical experience that is superior in gaming. Before cutting, Nike Vision positions the lens blank where the line of sight aligns with the lens's optical sweet spot for the best visual experience. The brand’s lenses are designed from polycarbonate and nylon lens materials, which are both shatter-resistant and lightweight. The technology uses by the brand makes eye protection easy. It filters 100% UVA / UVB which both bring harmful effects to the eyes. The lenses used by the brand make use of an advanced hydrophobic layer which makes way for a scratch-resistant surface that repels liquids. Because of this, you can easily wipe off the water, salt, sand, oil, dirt, dust, perspiration, and even fingerprints. One of the most common concerns of the players is the glare coming off from the sun while on field and playing. Apart from it hurts their eyes, too much sunlight also distracts players and could not be 100% focused. This eye shield offers a glare-free feature that solves all these problems. One of the most obvious things you will notice is the shape of the visor. The Nike Gridiron Eye Shield has a curve shape. This shape allows for maximum optical vision on the side. Some eye shields are kind of flat that it leaves a distortion on the peripheral vision. It is also designed with soft rubber washers which help lessen the risk of cracking which might be a problem when you are playing. The eye shield is made with polycarbonate which also gives each user an advantage. This material is generally hardwearing, enough to give you confidence while you are in the game. The package comes with big and small clips for your different face masks. The black clips are the larger size while the dark gray clips are the smaller ones. The clips also have marks to know which ones should be used for the left or right parts of the mask. It makes a lot easier for players to know which clips go to what side of the helmet. It also comes with the decals sticker of various colors (red, black, blue). Moreover, when you put on the clip of the visor, you do not need to force it in as it fits properly. This visor comes in clear, grey, and mere. Unlike other brands, the opacity of the visors of Nike does not have percentages on its model. 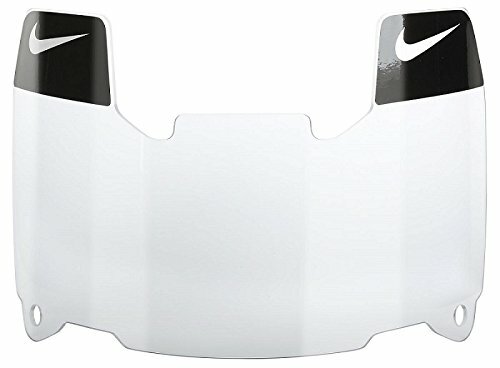 The Nike Gridiron Eye Shield with Decals 2.0 is one of the leading products when we speak of football visors. The brand prides itself in developing advanced technological features to be able to come up with the demands of the sport. It has features for eye protection, resistance to impact, scratches, and liquids, etc. It is also NCAA and NFHS approved and fitted most helmets, so it saves you from the hassle.